It's all about the angles! If there's an outlet open, you should be able to use it. 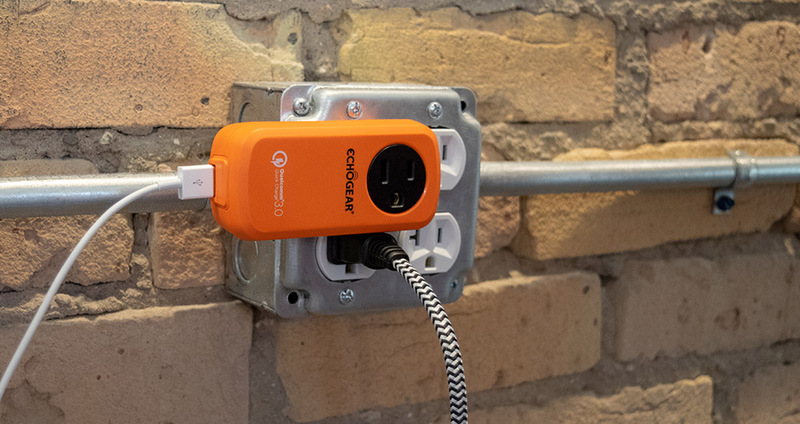 This quick charge USB/AC wall charger lets you do just that, thanks to fully-rotatable prongs. Let's speed this up! 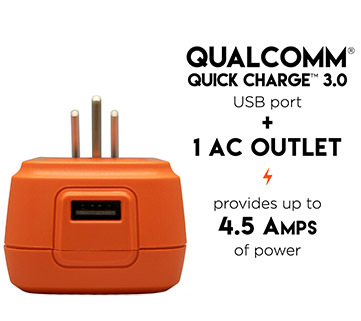 Utilizes Qualcomm® Quick Charge™ 3.0 charging port, giving you up to 3.0A of USB-A power. 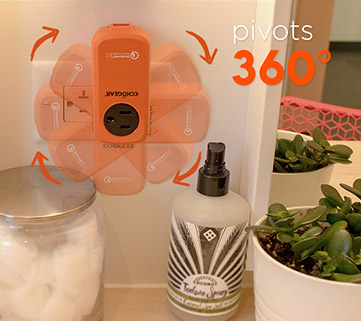 You spin me right 'round: Charger rotates 360-degrees so you can plug into any outlet, without blocking another. This is why we CAN have nice things! Fold-in prongs keep your charger, your bag, and the stuff in your bag safe from damage. Also includes an AC outlet, so you can power 2 devices at once. Wanna travel like a baller? First step, get a top-notch travel charger. 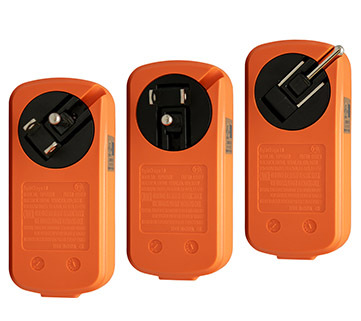 When it comes to the perfect travel charger, what do you think of? Well, put on your orange colored glasses, because we've built this charger to be the ideal travel companion for you and your gadgets. It's got a bunch of sweet features packed into it and is ready to be thrown in your carry on. Plug your compatible device into the USB port at the bottom of the charger for a lightning-fast charge. Go from 0%-80% in 35 minutes. Yes, you read that right. Play as much Fortnite Mobile as you want, a fast charge is ready when you need it. Plus, you won't lose a regular outlet with this charger. That way you can have your laptop and phone plugged in, even in a crowded airport, turning you into a charging savant. Yes, a savant. Put it in your Twitter bio right now. You can spin this charger 360º to the perfect angle for any application. That'll make plugging your phone into that awkward outlet behind the bed in your shady motel room a little easier (ignore the rat skeleton), or you could stop staying at budget motels. Your call. On top of that, it'll keep you from blocking outlets. Chances are your current chargers are blocking so many outlets you call them Dikembe Mutombo. Consider that solved. Just spin the charger to any orientation you want. Bada-bing-bada-boom! Space is always at a premium in your carry on. Folding plugs make this charger easier to pack and carry, plus it won't damage anything else in your bag. We would hate for your Pokemon cards to get damaged in transit. That Charizard is still looking as crisp as the day you got it...in 1997. This charger can do it all and deserves a spot in your travel bag. Pick one up today to start charging like a seasoned traveler, even if it's just your first trip to the party capital of the world, Davenport Iowa. Click the button below to add the Portable Qualcomm Quick Charge 3.0 USB Charger With AC Outlet to your wish list.